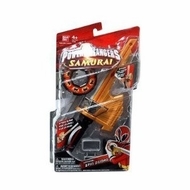 Get the power of the samurai with the Samurai Spin Sword wielded by all the 2011 Power Rangers! Spin the disc as seen in the TV Show. Watch the cool Zord from the disk come to life in an animation sequence. The reflective surface of the sword shows the powerful action of the zord when the disk spins.